A week ago, the press has announced a new Cloud Service: Hetzner Cloud is based in Germany but they offer Infrastructure as a Service (IaaS) in the US as well. You can rent computing resources at “unbeatable prices” as they point out; e.g. 1 vCPU and 2 GB RAM + 20 GB SSD cost less than 3 € per month (or around US$ 3), currently. Internet transfer of 20 TB is included. In this blog post, I am capturing the first experience I have gained with the service. 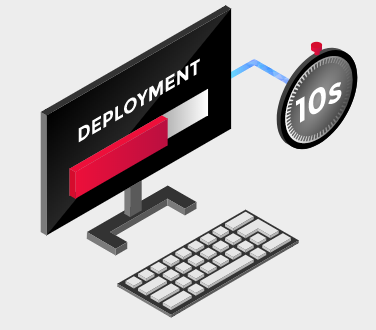 A server instance can be started in less than 10 seconds. This might not be too important for most of us, since there is a high probability to run the service 24hrs/7d a week, considering the low price of the service. Anyhow, the deployment time of 1o sec is convenient and it is very, very competitive, I think. Note, that a server costs the same money, whether or not it is switched on. In the Q&A section, Hetzner argues that they need to reserve resources since they want to keep their promise that your server is available in less than 10 sec after you hit the “power” button. My guess is, that the virtual machines are always up and running. Or they are using container technologies like LXD, which allow for quick boot-ups paired with the convenience features you are used to from the virtual machine’s world (e.g. suspend/resume). AWS: 16.82 US$ + VAT for 1 CPU, 2 GB in US East with disk and Internet transfer to be paid separately. As heise.de is stating, you need to pay for any extra services, even if you are used to getting those services for free in case of other cloud providers. The largest available server in Hetzner’s cloud service has 8 vCPU and 32 GB RAM. On the other side, AWS offers instances with up to 128 CPUs and 3904 GB RAM (x1e.32large). This is a factor of 16 with respect to CPU and a factor > 100 (!) with respect to RAM. If you want to go with Hetzner, but you need larger servers with up to 256 GB RAM, you might consider to make use of their dedicated root server service. You can get such a such a root server for 139 € per month in Germany and ~117 €/month in the US, currently. This is more than competitive. 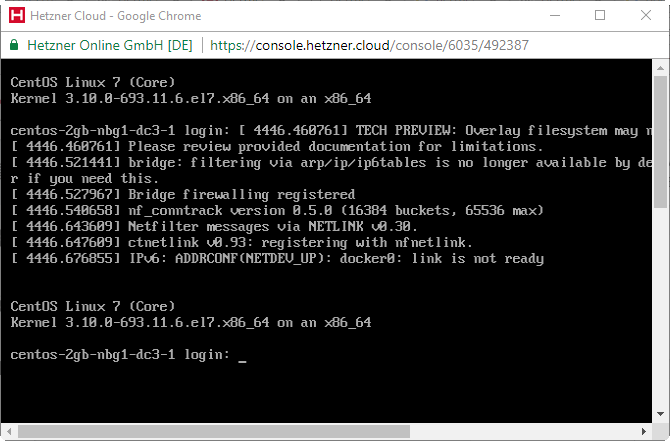 This is a feature not many cloud providers offer to their clients: you can access the command line console of your servers via a web browser. However, there is a big BUT: the access requires you to set a password for the user, which can be used in the SSH access as well. I would not recommend doing so, because of security reasons. For me, the feature would be usable only, if they’d implement a solution that does not rely on password authentication. Here, a single sign-on solution would be perfect. Quite some time ago, I have created a blog post on my search for a provider that allows installing a virtual machine instance from CD/ISO image. I was disappointed to see that AWS as the number one IaaS provider in the market does not offer such a service. I had found another provider, but at the end, I was not too happy with the support of this provider. Now, we can see, that Hetzner cloud offers this functionality as well. You even can send your own ISO to Hetzner’s team, and they will make it available privately to your account, as they point out. First, I got it wrong and I thought that they charge 50 € if you want to write integration code using their API. However, as Katie Snow has pointed out in her comment, it is the other way round: “If you are developing integrations based on our API and your product is Open Source you may be eligible for a free one time €50 (excl. VAT) credit on your account.” I.e., Hetzner wants to promote the usage of their API, which makes perfect sense for a newcomer in the IaaS space. All servers are reachable via the Internet. This might be convenient for some among us, but it also might be considered as being too insecure for others. The server is open to brute force intrusion and denial of service attacks from the Internet. The recommendation of Hetzner’s support hotline: Install an onboard firewall (e.g. iptables). In addition, I recommend to never create a user with password. Still, a provider provisioned firewall in front of the server would be a better solution, in my opinion. I guess, it is not fair to compare the feature richness of Hetzner’s cloud with those of the big IaaS providers AWS and Azure. Anyhow, if you decide to go with Hetzner’s Cloud service, do not expect to be provided with infrastructure and services you are used to be available for AWS and Azure. Configurable firewalls and load balancers you not in the portfolio of Hetzner’s cloud (yet). You also will not find other services like templating, docker orchestration, database service, autoscaling, etc. to name only a few. File-based storage seems to be available as so-called storage-boxes, but the attachment to Hetzner cloud servers and its price model for the data transfer between box and cloud is still to be investigated. Hetzner’s cloud offers computing resources for “unbeatable prices”, as they point out. On-demand computing resources are offered for prices AWS users can only dream of. However, you cannot expect a new cloud provider like Hetzner to offer all the features you are used to finding in clouds run by AWS, Azure or Google engine. You will get fewer compute options to choose from and much lower maximum compute resources per server (only up to 8 vCPU and 32 GB RAM). And your search for services like configurable firewalls, load balancers, templating a.s.o. will be in vain. However, if you are looking for an unbeatable price paired with some nice, convenient features like browser console access and user-defined ISOs, together with a responsive support hotline, Hetzner does seem to be a good candidate. Nice blog post! We’re so excited to see customers like you show an interest in our new products! It seems that there is a misunerstanding. We do not want to _charge_ you €50 for developing something. We want to _offer_ you €50 to develop open source integrations. On our API, we write: “If you are developing integrations based on our API and your product is Open Source you may be eligible for a _free_ one time €50 (excl. VAT) credit on your account”. If you would like to _receive_ €50 for creating an open source integration, please contact our team by writing a support request on Cloud Console. We hope that you have fun with the Hetzner Cloud! Hi Katie, you are perfectly right. That was a misunderstanding from my side and I have corrected the message in my blog post. BTW, how have you found my blog post so quickly? I thought about contacting Hetzner myself in order to get a review of the post; I wanted to make sure that my data is correct. And I have got some more questions about the service. Maybe this blog post is a good forum to discuss those. May I start asking? – I have seen that the service is cheaper in the US than it is in Germany. Based in Germany, can I rent resources in the US for those even lower prices? I have not seen a way to choose between Germany and the US. – Do you support VLANs? I guess no? The only networking feature I have seen is a floating IP. I guess, different “Projects” have their own, single VLAN, though? – Can machines on different projects reach each other on their private IP addresses?